Clinical Trials are essential in improving the health and well-being of our community as they produce the best data available for healthcare decision making. Clinical trials can also provide direct benefit to participants by providing them with better treatments, therapies and diagnostic tests. To ensure clinical trials run at, and by, the University of Tasmania are of the highest quality, the Clinical Trial Governance Authorisation Process (PDF 97KB) has been established in addition to ethical review. 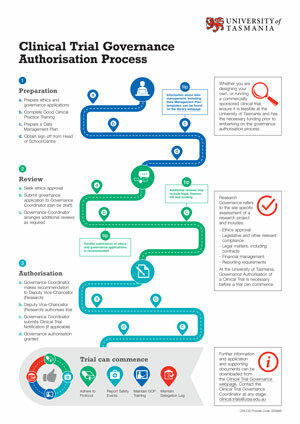 An infographic (PDF 67KB) of this process has been developed to support researchers. Governance authorisation and ethical review may occur in parallel. The outcomes of the ethical review and governance review together make up the final documentation that is provided to the Deputy Vice-Chancellor (Research; DVCR). These documents collectively allow for consideration of all aspects of the clinical trial governance arrangements and will assist the DVCR decision on granting authorisation to conduct the clinical trial. Research cannot commence at a site until governance authorisation has been granted. Information regarding the Australian Clinical Trials Environment and national initiatives is available on the National Health and Medical Research Council (NHMRC) webpage. Clinical trials are research investigations in which people volunteer to test new treatments, interventions or tests as a means to prevent, detect, treat or manage various diseases or medical conditions. Some investigations look at how people respond to a new intervention* and what side effects might occur. This helps to determine if a new intervention works, if it is safe, and if it is better than the interventions that are already available. Clinical trials might also compare existing interventions, test new ways to use or combine existing interventions or observe how people respond to other factors that might affect their health (such as dietary changes). 'any research study that prospectively assigns human participants or groups of humans to one or more health-related interventions to evaluate the effects on health outcomes'. Researchers may also conduct clinical trials to evaluate diagnostic or screening tests and new ways to detect and treat disease. *The word 'intervention' is used to refer to interventions, treatments and tests throughout this website. This definition of a clinical trial is taken from the Australian Government's clinical trial webpage. For assistance in determining whether your research project is a clinical trial, use this decision aid (PDF 71KB). If your project is a clinical trial, the next step is to determine what role the University of Tasmania is playing. A clinical trial sponsor is defined as the organisation which takes responsibility for the initiation, management and/or financing of a clinical trial. In this scenario the University’s only involvement is in the ethical review of the project. The trial is being conducted by an external group, at a trial site that is not the University. Governance application process: No governance application required. Other requirements: See the Health and Medical Research Human Research Ethics Committee (HREC) submission requirements. A HREC review only indemnity will be required for commercially sponsored clinical trials. If the trial involves the use of an unapproved therapeutic good, a Clinical Trial Notification (CTN) will need to be submitted to the Therapeutic Goods Administration. 1. A pharmaceutical company is sponsoring a clinical trial which is to be conducted at the Launceston General Hospital. The University is the sponsor of the clinical trial, but is not involved in the conduct of the trial (i.e. is not a trial site). As sponsor the University takes responsibility for the initiation, management, provision of insurance and indemnity, and/or financing of the clinical trial. Further information about clinical trial sponsors is available at the Australian clinical trial website. Governance application process: A Sponsor Only Governance Application Form (WORD 180KB) must be completed at or before the time of ethics submission. The Governance Application Form includes details of all governance requirements, including any legal and regulatory requirements. Other requirements: See the Health and Medical Research Human Research Ethics Committee (HREC) submission requirements. If the trial involves the use of an unapproved therapeutic good, a Clinical Trial Notification (CTN) will need to be submitted to the Therapeutic Goods Administration. Complete the application form (WORD 173KB) and submit this alongside your Governance Application Form. 1. An NHMRC grant is awarded to a clinician holding a conjoint appointment at the University and Royal Hobart Hospital. The grant is administered by the University, and the University takes on the role of sponsor, but trial is conducted at the Royal Hobart Hospital. 2. A University of Tasmania employee designs a new medical device that requires testing in patients. Hospitals around Australia conduct the trial, with the University of Tasmania responsible for the overall conduct of the trial as sponsor. The University of Tasmania is conducting the trial by recruiting and treating participants, but is not taking overall responsibility for trial oversight. Governance application process: A Site Only Governance Application Form (WORD 185KB) must be completed at or before the time of ethics submission. The Governance Application Form includes details of all governance requirements, including any legal requirements. Other requirements: See the Health and Medical Research Human Research Ethics Committee (HREC) submission requirements. If the trial involves the use of an unapproved therapeutic good, a Clinical Trial Notification (CTN) will need to be submitted to the Therapeutic Goods Administration. 1. A pharmaceutical company is conducting a clinical trial at sites all around the world, the University of Tasmania is one of these site. The company has provided the protocol, funding and the investigational product, the University of Tasmania recruits and treats the participants and collects the data on behalf of the company. 2. University of Tasmania employees have collaborated with employees of another University to design a clinical trial of a device. The other University is the administrating institution for the NHMRC grant, and has entered into a collaborative clinical trial agreement with the University of Tasmania. The other University takes overall responsibility for the clinical trial, however the collaborative agreement specifies that some sponsor responsibilities have been delegated to, or shared with the University of Tasmania. The University of Tasmania is responsible for all aspects of the clinical trial, including design, conduct and oversight. The trial may or may not be conducted at other sites in addition to the University. Governance application process: A Site and Sponsor Governance Application Form (WORD 187KB) must be completed at or before the time of ethics submission. The Governance Application Form includes details of all governance requirements, including any legal and regulatory requirements. Other requirements: See the Health and Medical Research Human Research Ethics Committee (HREC) submission requirements. If the trial involves the use of an unapproved therapeutic good, a Clinical Trial Notification (CTN) will need to be submitted to the Therapeutic Goods Administration. Complete the application form and submit this alongside your Governance Application Form. 1. A University employee designs a clinical trial to test a medicine in a population of the community, and the participants are seen at the Menzies Clinical Research Facility. Funding for the trial has been received from the Bill and Melinda Gates Foundation and the drug manufacturer is supplying the medicine. 2. A clinical trial has been designed by a University PhD student to test the usefulness of an online maths training game. Participants are recruited through local primary schools and they undertake the training at home on their family computer. Funding for the project has been provided through Faculty funds. Even though the ‘site’ of the clinical trial is the family home, the University takes responsibility for this. 3. A pharmaceutical provides the University with a medicinal product to be used in a clinical trial but has no other involvement in the conduct of the trial. The University takes responsibly for the oversight and conduct of the trial. The Clinical Trial Governance Elements webpage includes information on Good Clinical Practice training, Data Management and more. It also has a number of templates to support the conduct of clinical trials at the University of Tasmania. For further information about Clinical Trials Governance, please contact the University’s Clinical Trial Governance team at clinical.trials@utas.edu.au . The Clinical Trial Governance team is responsible for assessing the site-specific (governance) aspects of clinical trials run at, or by, the University of Tasmania and making a recommendation to the Deputy Vice-Chancellor (Research) as to whether the trial should be authorised. The Clinical Trial Governance team is able to assist researchers and industry sponsors in the design, initiation and conduct of clinical trials. A state-wide Clinical Trials Governance Steering Committee is responsible for developing effective workflows between the Department of Health and Human Services, the Tasmanian Health Service and the University. The Committee participated in the NHMRC Good Practice Process for site assessment and authorisation of clinical trials. If you are conducting the trial at a Tasmanian Health Service (THS) site, or a Department of Health and Human Services (DHHS) site/clinic you will need to seek governance authorisation from each site. Contact the site for information about their site specific processes.